Christmas is a special time when we can let go and immerse ourselves in a world of festive wonder. 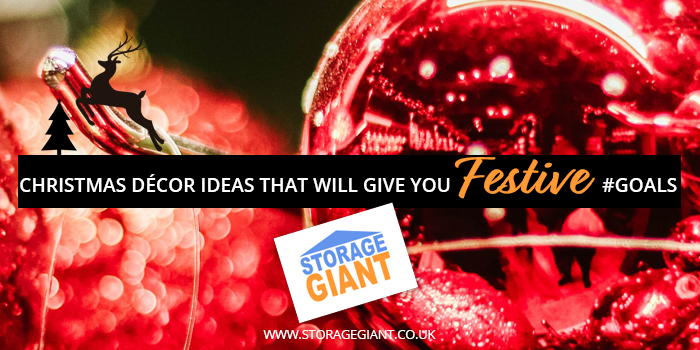 Here at Storage Giant we’ve rounded up five of our favourite Christmas decoration ideas to add a touch of magic to your home in affordable and effortless way. Do you remember the time when fairy lights were only seen wrapped around your Christmas tree? Well, we’ve good news for you – now you can use them EVERYWHERE! Strings of delicate lights can also be left up post-Christmas, helping to create a warm, cosy and soft-lit atmosphere. Now, make your way to your self-storage unit and get the lights out! Warm up “cold” themes of white and silver by using warm lights, candles and fluffy throws. Remember that details are important too – if you want to add an extra dose of sophistication, decorate the tree’s twigs with metallic or champagne spray to craft an impression of glamorous, sparkling texture. If you’re opting for classy yet unconventional Christmas décor, the must-have item on your shopping list is a statement object. This might be, for instance, a donut ornament or a large reindeer in gold champagne glitter that will add a touch of individuality to your fireplace. Did you know that the Christmas traditions of many countries established Christmas candles as a symbol of the birth of Jesus? Moreover, they provide an instant and flattering glow. This year, to make your Christmas table look even more special, drop basic, bold white candles into transparent vases. If you want to go one step further, you might want to think about creating jar forests – all you need to do is organise a little trip outside in order to get a few bits and bobs like pine cones that can be sprayed and arranged inside your vase. Christmas is all about comfort, so make sure that you have plenty of cosy throws available which will add to the décor as well as keeping you toasty and warm at the end of a busy Christmas day. #ChristmasGoals!